Playing with bubbles never gets old, but did you know that you can fiddle around with another kind of bubble? Just to shake things up. A new video from Physics Girl details this exciting phenomenon, known as an antibubble. Instead of normal bubbles, which float in the air, these form when submerged in a liquid. As the name suggests, the science is similar to that of a bubble, but... anti. Bubbles are made up of a thin film of liquid enclosing a gas. 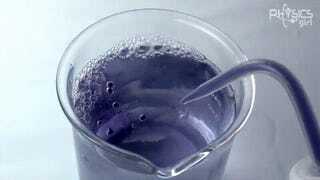 Antibubbles, on the other hand, are a thin film of gas enclosing a liquid. This isn’t quite the same as an air bubble, which is just a bubble floating in liquid. Instead, an antibubble forms when a droplet of liquid pulls some gas down along with it when it enters through the surface of another liquid. Air bubbles tend to rise to the top. Antibubbles tend to float submerged and slowly rise. Antibubbles are about as common as regular bubbles—they tend to form near soap—but they tend to pop more easily because, as the video describes, they are truly the opposite of normal bubbles. They’re also more difficult to form. Luckily, the video also goes into some ways to experiment with them. Here’s another description of an antibubble experiment, which uses similar methods as the one shown here.